In Android, the Task Manager acts like the one that you have on your Windows computer if you're familiar with it. The thing is, you can stop apps and services from running if you have access to it. Good news, it is very easy to access the Samsung Galaxy Note 3's task manager so you can monitor apps that currently run on your phone. 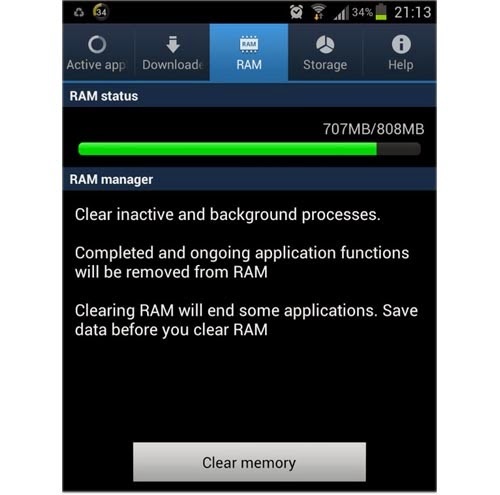 Samsung Galaxy Note 3: Managing Internal Memory (RAM) to do that. From the Home screen, press and hold the Home button. Tap the Task Manager icon that looks like a pie. To manage running applications, tap Active applications. You can tap End next to the app you want to stop or End all to simply stop all apps from running. To view availability of your memory card or internal memory, tap Storage tab. If the RAM is clouded with lots of cached data, tap the RAM tab and touch Clear memory. But I advise you to save necessary data first if you have to prevent them from getting lost. You could also tap the tabs section and drag your finger to the left tapping on Help tap to read about RAM manager and ways you can save your battery life. That is all about the Task Manager of your Samsung Galaxy Note 3. Again, it is one of the most important core functions of your phone so you should know that if your phone starts to run slow or sometime freezes and lags, clearing its memory or RAM often helps solve the problem. If you have questions or problems about your phone that you don't know how to fix, share them with us and we will do our best to find solutions for you, or at least, an explanation. Don't worry it's for free and we don't (never ever) share your email or other information with other party. Email us at sebertech@gmail.com anytime.